I smoke a lot of salmon, and I am proud of this recipe, although it would be the height of arrogance to say that what I do is the end-all, be-all of salmon smoking recipes. 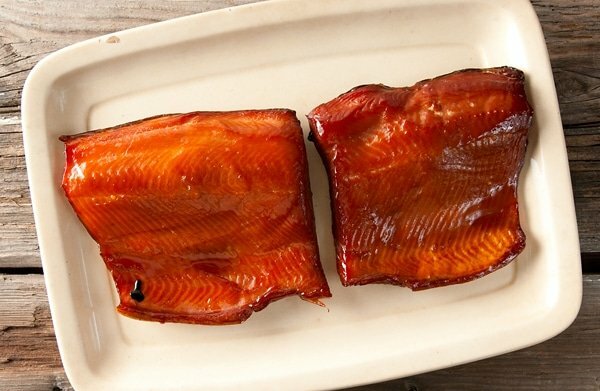 Lots of people smoke their salmon in lots of ways, and many of them are good. But I’ve been smoking fish for many years, and I’ve developed a system that works well. Keep in mind this is a hot-smoking recipe. Cold smoking, which is the kind of slice-able smoked fish you get in fancy boxes from Scotland is an entirely different thing. Almost everyone in Salmon Country hot smokes their fish. If you’re unfamiliar with hot-smoked fish, think about those golden smoked whitefish you see in delicatessens; those are hot smoked. How do you eat it? Well, you can just eat it plain, or you can flake it and make it into a smoked salmon salad, you can pound it with butter and make salmon rillettes, serve it in deviled eggs, tossed with pasta… you get the point. A smoker. 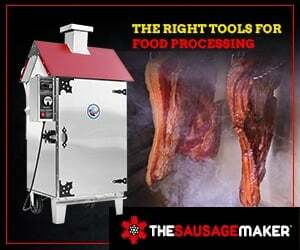 I’ve uses a Traeger and a Bradley. Both are good. No matter what smoker you use, you will need to be able to a) know your smoking chamber’s temperature, and b) control the heat, at least in a rough sense. Wood. The only downside to a Traeger smoker is that you need to use their wood pellets. As a guy who used a Brinkmann wood-fired BBQ for years, fueling it with scraps of almond and other fruit woods, buying wood can be annoying, but you get better precision with this method. I prefer to use alder wood for my salmon, but apple, cherry, oak or maple work fine. Salt. Buy a box of kosher salt from the supermarket. 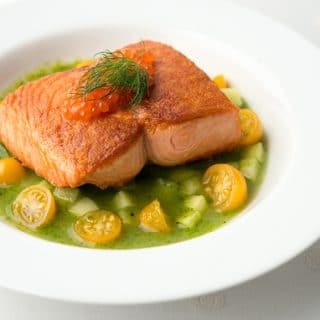 Do not use regular table salt, as it contains iodide and anti-caking agents that will give your salmon an “off” flavor. I use Diamond Crystal, which is cut finer than Morton’s. Something sweet — salmon love sweet. I prefer to sweeten my brine with birch syrup; It’s just like maple syrup, only tapped from birch trees instead. Super cool stuff. But maple syrup is just as good. Just use real maple syrup, OK? Not the imitation crap. Honey works, too. A large plastic container. Buy the big, flat ones from the supermarket. They stack easily in a normal fridge, so you can have two different brines going. And they clean easily and are pretty cheap. A wire rack. 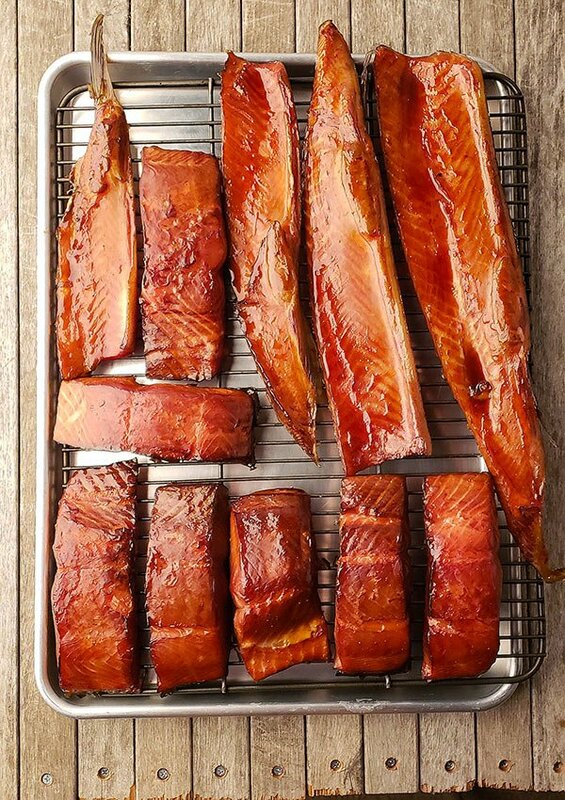 You need to rest your brined fish on a rack with plenty of air circulation to form the all-important pellicle (more on that in a bit), and you will use it to rest the smoked fish before storing it. A basting brush. You probably already have this in your kitchen, but if not, pick one up. Get the flat kind, like you use to paint detail on window trim. When you are ready to start, you will need smallish pieces of salmon about 1/4 to 1/2 pound each. Any salmonid fish will work with this recipe. I’ve done it with king salmon, sockeye, coho, and pink salmon, dolly varden, plus kokanee, steelhead and Lahontan trout. There is no reason it would not work with chum salmon or any other char or trout species. And yes, it works with farmed Atlantic salmon, but I never eat the stuff. I prefer to smoke salmon with its skin on, but I’ve done it with skinless pieces and it works fine. Note that my salmon cure is very simple. Feel free to add things if you like. I've added bay leaves, chiles, thyme, garlic and minced onion. All are fine, but subtle. And since I often use smoked salmon as a base for another dish, I want mine to remain simple and clean-tasting. You will need to cure your salmon at least 4 hours, even for thin fillets from trout or pink salmon. In my experience, large trout or char, as well as pink, sockeye and silver salmon need 8 hours. A really thick piece of king salmon might need as much as 36 hours in the brine. Never go more than 48 hours, however, or your fish will be too salty. Double the brine if it's not enough to cover the fish. Dry the Fish. Take your fish out of the brine and pat it dry. Set the fillets on your cooling rack, skin side down. Ideally you'd do this right under a ceiling fan set on high, or outside in a cool, breezy place. By "cool" I mean 60°F or cooler. Let the fish dry for 2 to 4 hours (or up to overnight in the fridge). You want the surface of the fish to develop a shiny skin called a pellicle. This is one step many beginning smokers fail to do, but drying your cured, brined fish in a cool, breezy place is vital to properly smoking it. The pellicle, which is a thin, lacquer-like layer on top of the fish, seals it and offers a sticky surface for the smoke to adhere to. Don't worry, the salt in the brine will protect your fish from spoilage. Once you have your pellicle, you can refrigerate your fish for a few hours and smoke it later if you'd like. Smoke your fish. Even though this is hot smoking, you still do not want high temperatures. Start with a small fire and work your way up as you go. It is important to bring the temperature up gradually or you will get that white albumin "bleed" on the meat. I can control my heat with my smoker, so I start the process between 120°F and 150°F for up to an hour, then finish at 175°F for a final hour or two. NOTE: What my smoker is set at is not necessarily what the actual temperature is. Smoking is an art, not a science. To keep temperatures mild, always put water in your drip pan to keep the temperature down. If your smoker is very hot, like a Traeger can get, put ice in the tray. You must be careful about your heat. 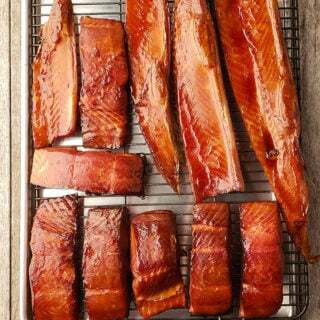 Other than failing to dry your salmon long enough, the single biggest problem in smoking salmon is too high heat. If you've ever seen salmon "bleed" a white, creamy substance, that's a protein called albumin. If you see lots of it, you've screwed up; a little is normal. Here's what happens: If you cook a piece of salmon at too high a heat, the muscle fibers in the meat contract so violently that they extrude albumin, which immediately congeals on the surface of the fish. It's ugly, and it also means your salmon will be drier than it could have been. You prevent this with a solidly formed pellicle, and by keeping your heat gentle. If you let your heat get away from you and you do get a white mess on your salmon, all is not lost. Just flake it out and make salmon salad with it: The mayonnaise in the salad will mask any dryness. Cool and Store the Fish. Once your fish is smoked, let it rest on the cooling rack for an hour before you put it in the fridge. Once refrigerated and wrapped in plastic, smoked fish will keep for 10 days. If you vacuum-seal it, the fish will keep for up to 3 weeks. Or freeze your fish for up to a year. One last piece of advice: Try to fill up your smoker with fish. This process takes a while to do, and your smoker doesn't care if its full or half-empty, so you might as well make a big batch. And keep in mind this recipe is for basic smoked salmon. Other options are smoked salmon candy, a great snack, and, once you have your smoked salmon, you can use it in smoked salmon dip on crackers. Find more recipes for salmon and trout here on Hunter Angler Gardener Cook! Karen: Yep, right on the grill. One trick is to slick up the bottom of the fish (I always do skin on) with oil. That helps a lot.